the need to make a separate national application in each of the Contracting Parties, in which they seek protection, thus avoiding the complications arising from procedures and languages which differ from one State to another. Streamlined prosecution. The Hague System was to avoid the need for monitoring renewal deadlines of national registrations and allow fee payments in a single currency. Single point of contact. Under the Hague Agreement, by means of a single international application, made in one language, on payment of a single set of fees, in one currency (Swiss francs) and with one Office (the International Bureau), the applicant was to receive a bundle of national rights. Simplified Management. Subsequent management of the international registration was to be easy, for instance in case of a change in the name or address of the holder, or a change in ownership. Based on our review of USPTO data, we believe the system does not live up to those promises. Our data rather suggests, that that foreign applicants attempting to secure design patents in the United States through a Hague filing may face a significant disadvantage. The Overall Allowance rate of design patent applications entering the US under the Hague agreement is much lower than applications filed as regular US design patent applications. Of 831 applications filed by entities in which neither the applicant nor the first inventor are US persons, 549 issued and 282 were abandoned. The resulting allowance rate of 66% is notably lower than the overall design patent allowance rate of 84%. One out of every three applications filed is a waste of money – the applicant receives nothing in return. Of those 549 applications that were allowed, only 156 were allowed in the first office action. The remaining 393 applications required a response to an office action, which usually requires the engagement of a registered US patent practitioner. We therefore believe, that less than 20% of Hague filings (156 of 831 applications) may have provided the applicant the desired benefits as suggested by WIPO. More than 80% of Hague filings likely didn’t. The majority of applicant’s either abandoned their US application altogether, or had to engage a US firm to help salvage the application. The reasons, Hague applications required a response to the USPTO will look familiar to those who prosecute design patent applications on a regular basis. Restrictions. In several of the cases we reviewed in detail a restriction requirement was issued. This is not unusual if more than one embodiment of a design is claimed in an application. Often, the Examiner will be looking for an admission that the claimed variants are obvious variations of one another. Drawing Quality. In some cases, the quality of the drawings submitted in the Hague application was of such poor quality that the US examiner rejected them. Overall, we found the Examiners to be surprisingly lenient in accepting photographs that we would have expected to be rejected in regular national design applications. Inconsistent Drawings. One of the skills we admire in design examiners is their ability to recognize inconsistencies between different views of drawings. If those views are created based on a “mental model” of the design it is very easy to miss something – and the examiner will point the inconsistency out in a rejection. Therefore, our best practice has been to create design patent drawings based on 3D CAD models (preferred) or at least photographs of a physical sample from different viewpoints. The CAD model and the physical sample inherently guarantee consistency between views. Insufficient Drawings. In many cases, design examiners will find a small detail that cannot be clearly determined from the views. For example, if the claimed design includes a blind hole, the depth of that blind hole cannot be determined from a plan view. A perspective view showing the bottom of the blind hole is required, or the application may be rejected for being ambiguous. In our experience, if the drawings of a design patent cannot be used to create an exact 3D reproduction of the claimed object, the applicant should expect a rejection. It appears, that international applicants are increasingly recognizing that filing Hague applications to avoid the cost of engaging a US firm does not pay off. An interesting chart copied from the USPTO’s dashboard for design patents shows a substantial decline from almost 200 international design applications received in October 2016 to less than 40 applications received in October 2017. 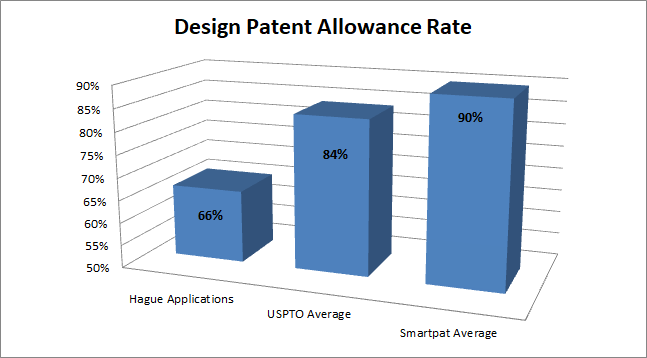 At Smartpat, design applications account for about 40% of our patent filings. Over the years we have grown used to, and even come to appreciate, the high expectations of the patent examiners we interact with. In many cases, we advise clients that drawings used in their overseas applications are insufficient for the US and that new drawings are required. Our primarily European clients and colleagues are not always happy with us, especially if we find areas of concern in the fifth revision of their self-prepared drawings and suggest additional changes. But those who follow our advice are rewarded with an allowance rate above 90% – compared with a USPTO average of 84%. If you are planning to file a Hague application to ultimately issue as a US design patent – think twice. In many cases, filing a national US design patent application with drawings that have been prepared specifically with the USPTO in mind will be beneficial and save the client headaches and cost in the long run. Alternatively, we offer clients to review their Hague filings for consistency with USPTO rules. Smartpat PLC is a boutique patent law firm. We draft and prosecute patent applications, in particular for inventions relating to optical, mechanical, electric, or electronic devices, including their software. Copyright © 2017 Smartpat PLC. All rights reserved.